This isn’t the first time when we’re talking about the iPad Pro, as the Cupertino-based manufacturer has been highly linked with releasing a new tablet, a larger one, to be more specific, this year. Still, it’s the first time when a launch date is mentioned! As stated by Tech Frag, the tablet will be Apple’s competitor for the Microsoft Surface Pro 3, as it will sport a display measuring 12.3 inches, being the biggest slate ever made by Apple. 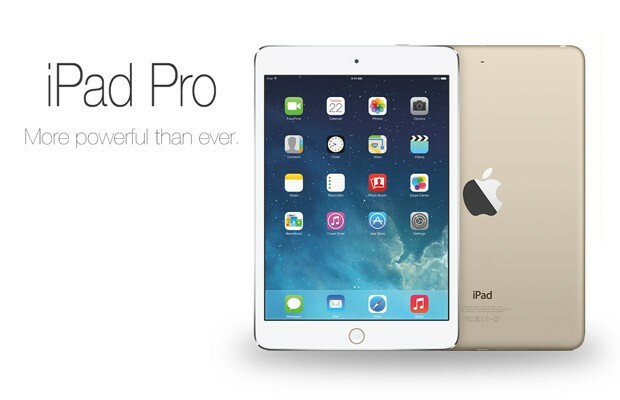 As for the above mentioned release date, the iPad Pro could be unveiled in October. Being part of the iPad refresh, the tablet should go into production in the third quarter of this year, followed by a launched event scheduled for later in the year, according to the same source. Besides the larger display, which should sport a resolution of 2560 x 1920 pixels, making the iPad Pro one of the tablets with the most sharpest displays on the market, the iPad Pro is expected to feature an updated spec sheet, compared to the iPad Air 2. A8X or A9, which one will it be? We’re talking about an A8X processor under the hood, even though we’re not so sure about this, as the A9 should make its debut this fall, alongside the iPhone 6S or maybe 7. Also, the tablet should sport 2 GB of RAM, the already famous Touch ID sensor and there’s a chance of seeing USB 3.0 ports too. Design-wise, the iPad Pro should follow the same design seen on the Air 2 and Mini 3, with a thin profile and very slim bezels. Finally, there were a few sources which are pointing to a stylus, but this is less likely, if you ask us. For the moment, this sums up everything we know about the iPad Pro, but keep an eye on our blog, as we will be back with more details on this topic as soon as anything new comes up.